U.S. Air Force Staff Sgt. Nicholas Crisp, 86th Airlift Wing Public Affairs broadcast journalist, reads a book to German children during an 86th Airlift Wing Host Nation Grassroots program trip to Dansenberg, Nov. 20. The Grassroots program is designed to get Airmen involved in the local community. Above: Members of the 86th Airlift Wing and members of the local German community stand for a photo during an 86th AW Host Nation Grassroots program trip in Dansenberg, Nov. 20. The Grassroots program partners military members and spouses with children in the local community to forge friendships and better American and German relations. The 86th Airlift Wing Host Nation Grassroots program partnered military members and military spouses with local Germans at an elementary school in Dansenberg, Nov. 20. 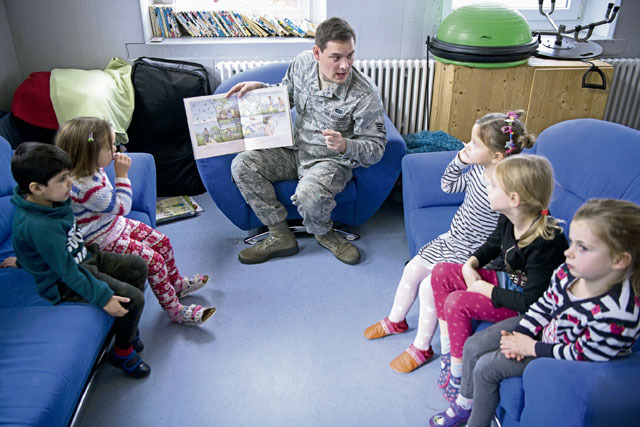 The event, aimed to promote reading to German youth, allows Airmen and families to engage and promote friendship, said Roberto da Costa, 86th Airlift Wing Host Nation chief. “The objective of the program is to involve Airmen socially in the local community, forge friendships and to raise awareness of German culture and general understanding,” said da Costa. Part of the program’s success is allowing Airmen to engage in community events in uniform, da Costa added. The 86th AW Host Nation office is looking for volunteers to assist with the next “Reach out and Read” Grassroots program. 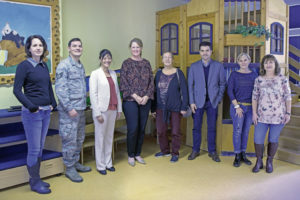 “The program is designed to offer [military members] a unique opportunity to engage in off-base recreational activities or community projects together with German participants and to showcase the Air Force community by being an ambassador,” said Eva Maldonado, 86th AW Host Nation advisor. All Airmen are welcome to volunteer. If interested, please call commercial 06371-47-2094 or DSN 480-2094.